Receive Sensitivity: Better than +82dBm. 【Built-in 2*10W speakers】---- Shocking sound quality, 3D surround sound, digital signal processing system accompanies with a high-fidelity sound system, let you immersive. 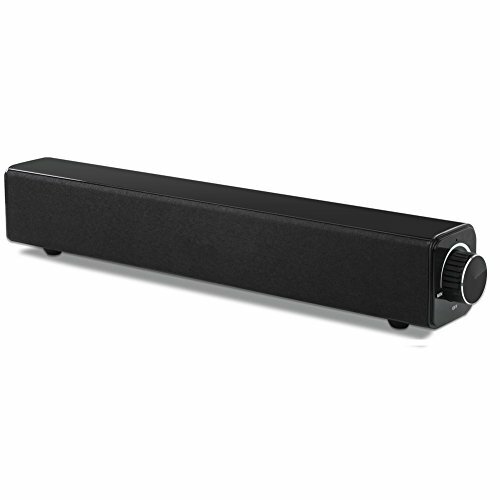 This soundbar is best for music, movie for party, meeting, camping, indoor and outdoor activities! 【Excellent Design】---- One side of Sound bar is black fabric and the other 3 sides are smooth and shining. With anti-magnetic, anti-noise, HQ chipset, LED indicator light and rotary button design with only one key to control switch and volume, the wireless speaker can be operated more easily. 【Longer Play Time & Low Battery and Low Voltage Remind】---- Portable sound bar built-in 4500mAh rechargeable Li-ion battery supports up to 12 hours of playtime. Let you enjoy music on a rainy day or sunny morning. When the speaker power is too low or the voltage is too low (below 3.3V) when charging, there will be a "dudu"sound, which is normal and you need to turn off the speaker for charging. 【Automatic Sleep Function】---- If you don't use the soundbar speaker for more than 10 minutes after power on, it will start automatic sleep function to save power. 【What We Offer】---- 1x Wireless Speaker, 1x AUX Cable, 1x USB Cable, 1x User Manual, 45-Day Money Back Guarantee, 6-Month Product Replacement Warranty and 24-Hour Friendly Customer Service.